Vi har valgt, at vores journalistik skal være tilgængelig for alle. Men den er ikke gratis at producere. Derfor håber vi, at dem, der kan, vil støtte os. Bankoverførsel Husk, at du kan trække dit bidrag fra i skat, hvis du tilføjer dit CPR nr. Fast overførsel Husk, at du kan trække dit bidrag fra i skat, hvis du tilføjer dit CPR nr. Hvis du allerede støtter Danwatch, siger vi mange tak og undskyld ulejligheden. Europe’s five largest pension funds have €7.5 billion invested in companies with business activities in and around illegal settlements in the occupied Palestinian territories. This is at odds with United Nations guidelines, clear warnings from 18 European countries, and undermines the two-state solution, experts warn. 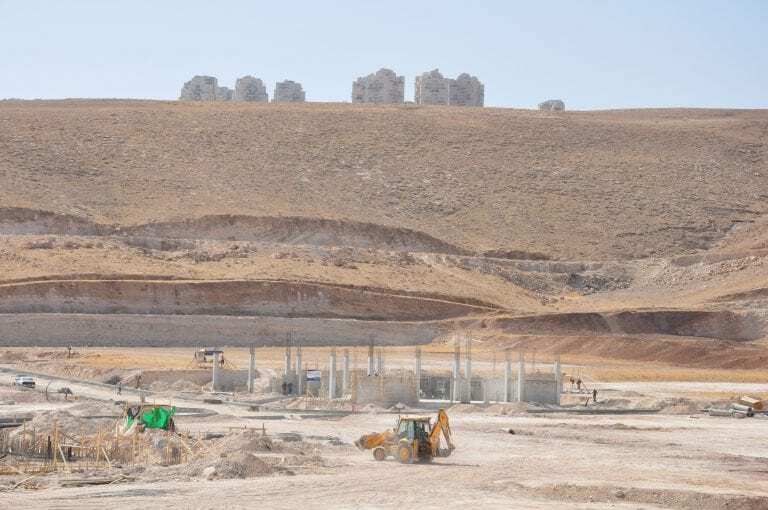 European investors have billions of euro invested in companies with activities in and around illegal Israeli settlements, according to a new investigation from Danwatch that screened the investment portfolios of Europe’s top five pension fund managers. Statens pensjonsfond utland (Oljefondet) (NO), Stichting Pensioenfonds ABP (NE), Pensioenfonds Zorg en Welzijn (NE), Arbejdsmarkedets Tillægspension (DK), and Alecta Pensionsförsäkring (SE) have a total of €7.5 billion invested in 36 Israeli and international publicly-traded companies, most of which have long been under public scrutiny because of their activities in the occupied Palestinian territories. [INSERT_ELEMENTOR id=”8121″]Hugh Lovatt, expert on Israel and Palestine at the respected think-tank European Council on Foreign Relations, explains the problem with settlements:“Israeli settlements in the occupied territories are illegal and have led to the dispossession of Palestinians and the fragmentation of Palestinian land. They infringe on Palestinian rights and exploit Palestinian natural resources.”Business activities in and around settlements in the occupied Palestinian territories are not necessarily against the law, but according to the United Nations, investors are obliged to carry out enhanced due diligence and to demonstrate that their activities do not contribute to negative effects on human rights. Overview from the European Council on Foreign Relations of the 18 EU countries (in green), which to date has published indicative warnings to citizens and businesses about the risk of legal, financial and reputational consequences of financial and economic activities in the settlements. In addition, 18 European countries warn their citizens and businesses in no uncertain terms against undertaking financial and economic activities that could support illegal Israeli settlements. “Financial transactions, investments, purchases, tenders, and other economic activities (including services like tourism) in Israeli settlements or benefiting Israeli settlements are associated with legal and economic risks due to the fact that, according to international law, the Israeli settlements are built on occupied land and are not recognised as a lawful part of Israel’s territory,” wrote the Danish Foreign Ministry in a 2014 statement similar to statements published by other countries. “One should also be aware of possible violations of international humanitarian law and human rights,” the statement warns and refers to OECD Guidelinesfor Multinational Enterprises (2011) and United Nations Guiding Principles on Businessand Human rights(2011). In addition to the “increased risk of adverse human rights impacts”, as the UN puts it, European investors are also actively undermining the official policy of the EU regarding a two-state solution to the Israeli-Palestinian conflict. The largest single investor by far is Statens Pensjonsfond Utland, the Government Pension Fund of Norway, with €5.2 billion out of the total €7.5 billion invested in all 36 companies on Danwatch’s list. This includes €135 million in Caterpillar, which supplies bulldozers for the demolition of Palestinian homes in the occupied territories; €286 million in HeidelbergCement, which has been blacklisted by several other European investors due to exploitation of Palestinian natural resources; and €1.5 billion in Siemens, which has installed traffic systems on Israeli roads in the West Bank and placed bids on projects on occupied territory with Israel Railways. 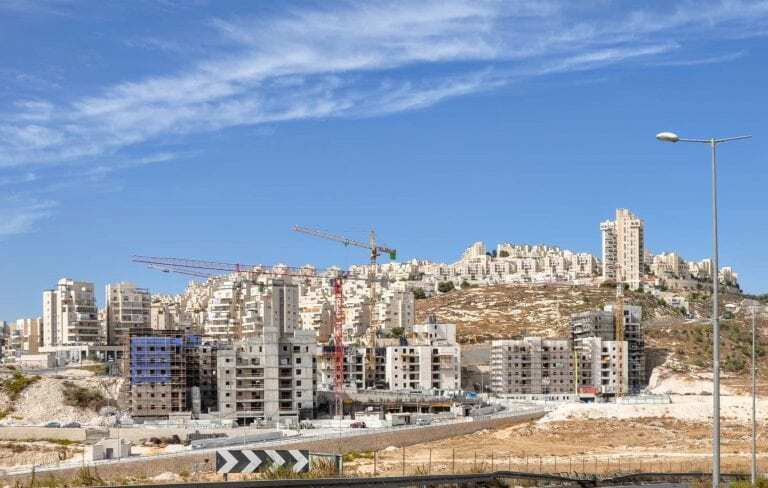 The Norwegian Government Pension Fund also has €233 million in five Israeli banks financing settlement construction and operating in the West Bank in various ways: Bank Hapoalim, Bank Leumi, First International Bank of Israel Ltd, Israel Discount Bank Ltd and Mizrahi Tefahot Bank Ltd. These same banks are blacklisted by Europe’s third largest pension fund Pensioenfonds Zorg en Welzijn (PFZW) (NE) which in 2014 ended several years of dialogue. “Given the day-to-day reality and domestic legal framework they operate in, the banks have limited to no possibilities to end their involvement in the financing of settlements in the occupied Palestinian territories,” wrote PFZW (formerly PGGM) about the decision to divest from Bank Hapoalim, Bank Leumi, First International Bank of Israel, Israel Discount Bank and Mizrahi Tefahot because they finance settlements and operate branches on occupied territory. “Our expectations are especially relevant for companies with direct operations, supply chains or other business relationships in high-risk sectors, high-risk geographical areas, or otherwise high-risk operational environments,” they explain. The Norwegian oil fund’s decisions about excluding specific companies is regulated by an independent council appointed by the Norwegian Ministry of Finance. Of the five largest European pension funds, Denmark’s ATP is by far the smallest investor in companies on Danwatch’s list, with about €1 million in total in Siemens and The Priceline Group Inc, the owner of booking.com, which facilitates hotels in a number of settlements. However, ATP’s publicly available stock portfolio does not include index futures, which amounts to almost 95% of ATP’s entire foreign holdings. On the two specific investments, ATP explains that Danwatch’s findings includes new information not covered by their external screening partner, and that they will have to consider this before they can answer specific questions. Sweden’s largest pension fund, and Europe’s fifth-largest, Alecta Pensionsförsäkring, only has investments in one company on Danwatch’s list: Volvo Group. The Swedish industrial conglomerate partly owns Merkavim, which provides armoured busses for Egged bus lines in the West Bank, where Volvo busses are also used for transport. 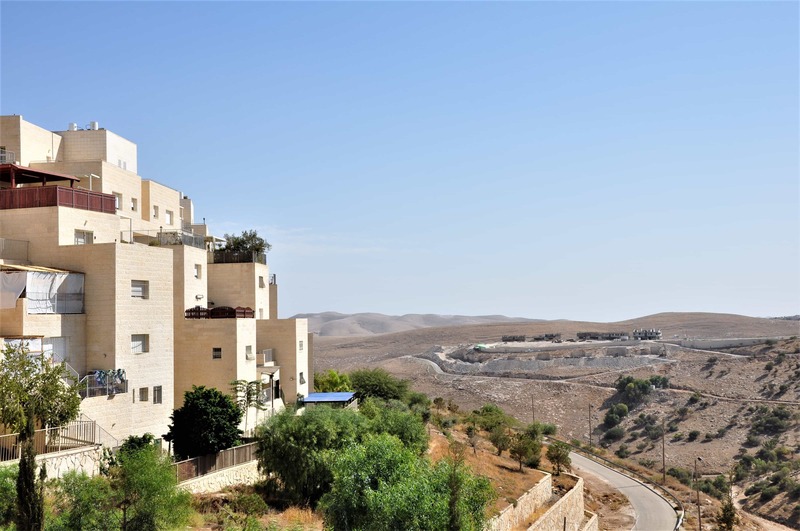 Two Volvo-certified garages operate in the illegal industrial zones of Mishor Adumim and Atarot in the occupied West Bank. Furthermore, Volvo excavators are used by the Israeli army to demolish Palestinian houses on occupied land, as documented in February, April and October 2016 in the Palestinian villages of Jinba, Halaweh, Um Al Kher and in the Jordan Valley. Danwatch presented these findings to Volvo Group, but received no reply. Alecta Pensionsförsäkring explains to Danwatch that their due diligence is outsourced to external partner GES, and that GES confirm their knowledge about the issue and have concluded that Volvo Group’s activities is not a breach against international conventions. 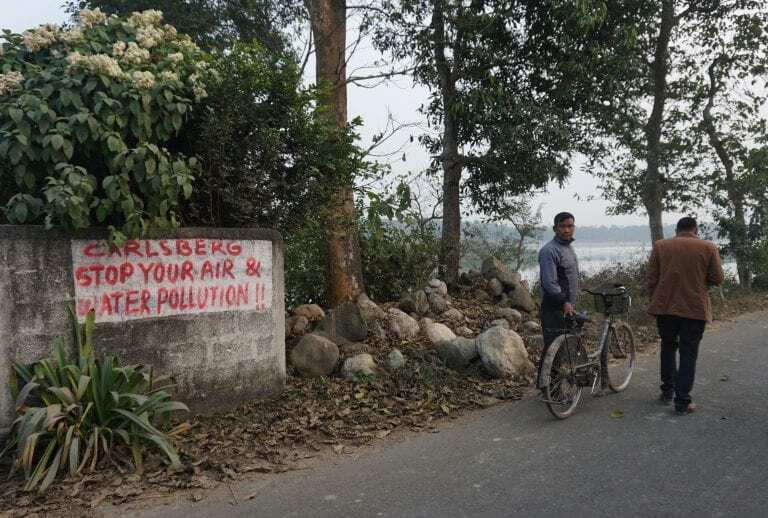 “Volvo has limited possibilities to influence how their products are used and we believe that Volvo cannot be directly linked to human rights violations,” Swedish investor Alecta therefore tells Danwatch. “Alecta has an active and ongoing dialogue with Volvo as well as with our external partner GES and has so far not received any indication pointing towards an exclusion. If necessary we will as a first priority engage further in our dialogue with Volvo to make them comply with international law, rather than exclude them as an investment,” Alecta says. Danwatch also contacted the two Dutch pension funds Stichting Pensioenfonds ABP and Pensioenfonds Zorg en Welzijn (PFZW), but received no reply. Bliv støttemedlem (fast valgfri overførsel) Husk, at du kan trække dit bidrag fra i skat, hvis du tilføjer dit CPR nr. Danwatch is an independent Danish prize winning investigative media and research centre, specialized in investigative journalism on global issues.We investigate states’, companies’ and investors’ impacts on human rights and theenvironment, and hold power to account in the public interest. Har du en idé, eller har du kendskab til forhold, som du mener, vi bør undersøge – så kontakt os. Det kan også være, at du er freelancejournalist med en god ide – skriv eller ring. Du kan bruge formularen – også anonymt – men vil du være helt sikker på, at ingen kan spore din kommunikation til os, anbefaler vi, at du installerer app’en Signal på din telefon. Bemærk, at du skal donere min. 200 kr. for at dit støttebidrag kan være med til at kvalificere os til at søge Tipsmidler. Husk at skrive dit fulde navn, og gerne din e-mail som kommentar til overførslen. Tilføj dit CPR nr i kommentarfeltet, hvis du ønsker skattefradrag. Want to make an international donation? Du kan bakke op om Danwatchs arbejde ved at blive fast bidragyder ved et månedligt eller årligt beløb. Som fast bidragsyder får du gratis adgang til arrangementer. Husk, at du kan trække det fra i skat, hvis du tilføjer dit CPR nr.